Buses leave from Central Station every 15-20 minutes. From March to October buses depart from 9.15 to 19.00 and from November to February buses depart from 9.30 to 18.00. The Hop-on Hop-off bus is a great anytime and any day. We are comparing Hop-on Hop-off Bus Tour Amsterdam Prices from leading ticket suppliers and Try to find you Cheap tickets prices on the market. Climb aboard the iconic big red bus and start exploring the unique streets of Amsterdam's UNESCO protected city centre. Whilst onboard you can listen to an audio guide in your chosen language and learn about 17th-century architecture, local stories and restaurant tips. But, if you prefer, you can just relax and the top deck and admire the marvellous architecture surrounding you. The best part is that the Hop-on Hop-Off bus gives you full flexibility so you can make your own itinerary. The full loop from Central Station takes approximately 1 to 1.5 hours but you are welcome to jump off at any of the marked stops. 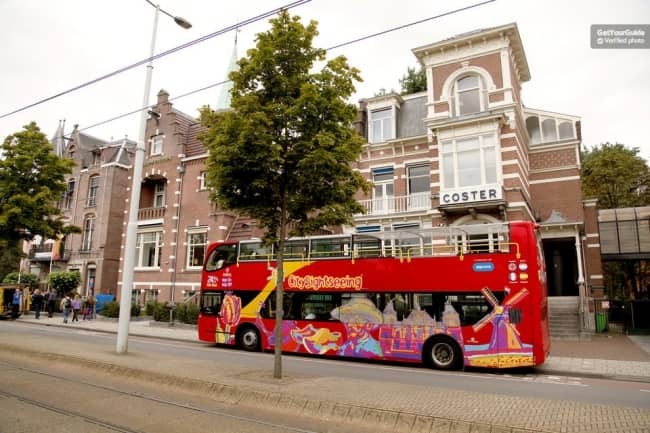 The bus line will take you within walking distance of all of the city's best attractions and museums such as the Heineken Experience and Van Gogh Museum, as well as the Jewish Quarter and Red Light District. This bus ticket gives visitors the freedom to explore the wonderful city centre of Amsterdam at their own pace and visit the attractions which suit them. We recommend this ticket for travellers who would like a flexible itinerary. Suitable for individuals, groups, children and wheelchair users. Your Experience With Hop-on Hop-off Bus Tour Amsterdam? Enjoy a complete and flexible tour of Central Amsterdam on the well-known open-top city sightseeing bus. Create your own itinerary and Hop-on or off the big red bus at any of the 11 stops. Explore with ease because each stop is located close to one or more of Amsterdam's top museums, attractions and famous districts. Learn about the city from a live guide or multilingual audio guide. Admire the fantastic architecture of this water-filled city as you ride between the best Amsterdam attractions. Enjoy stress-free travel around Central Amsterdam for 24 or 48 hours and benefit from the freedom of the Hop-On Hop-Off tour. What Hop-on Hop-off Bus Tour Amsterdam Includes? Hop-on Hop-off bus ticket valid for 24 or 48 hours. English speaking Local Guide or Audio Guide in up to 18 languages, including English, Dutch, French, Spanish, Italian, German and Russian. Join the Hop-on Hop-off bus at any of the following stops: Central Station, Amrath Hotel, Windmill, Artis Zoo, Gassan Diamonds Factory, Jewish Historical Museum, Sarphatistraat, Heineken Experience and Museum Square. Travelers Reviews about Hop-on Hop-off Bus Tour Amsterdam? This tour has an average of 4.5 out of 5-stars on TripAdvisor, Get Your Guide and Viator. Travellers recommend this tour for anyone with limited time in the city. Generally comments agree that the service operates very well and that the bus's staff are very informative and helpful. Reviews point out that this is probably the easiest way for first-time visitors to find their way around the city. You must bring your ticket in paper or electronic form. Depending on the supplier, some tickets are non-refundable however some can be cancelled without fees if cancellation is made in 1-7 days advance. Entry to Museums/Attractions are not included in the 24 or 48 hour pass unless selected when booking. The pass is valid for 24 or 48 hours from the first use.